Arnica is an alpine plant and for this reason it does not thrive in our lowland Derbyshire soil at ‘The Field’. 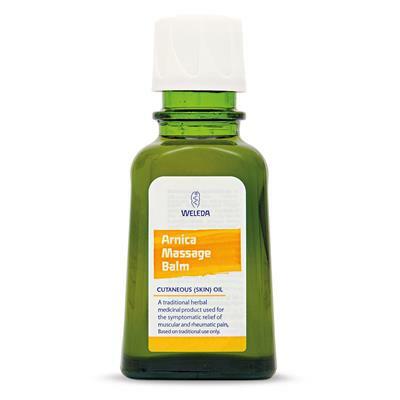 Instead, Weleda obtains Scottish-grown and biodynamically cultivated arnica from the herb gardener, Duncan Ross. Each year Duncan makes a ten-hour drive with a freshly-harvested crop. The day before the crop arrives, Duncan and four other gardeners are busy, carefully lifting each arnica plant, roots and all (planta tota), washing the roots and removing any discoloured and broken leaves. The plants are then placed upright in boxes, with their roots in fresh water, ready for the journey to Weleda Head Office. In the cool twilight hours, he sets off transporting around 100 kilos of whole fresh plants. Our Weleda gardeners meet and greet Duncan early doors and take delivery of his precious cargo. 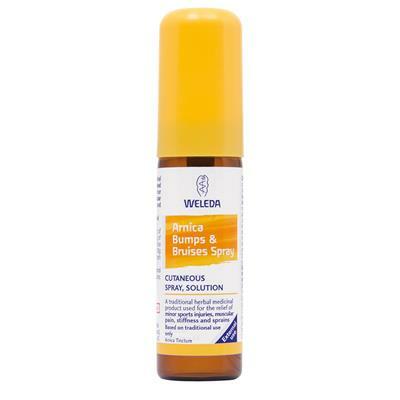 Every member of staff at Weleda knows when it’s ‘Arnica day’ and are primed to chip in as and when they are required. 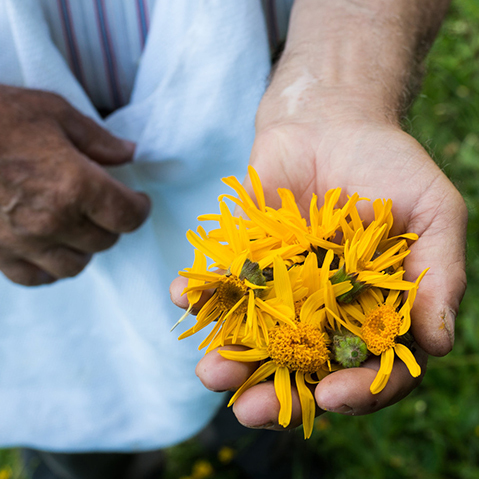 It is critical the arnica plants are processed as soon as possible in order to capture the plant’s vitality. 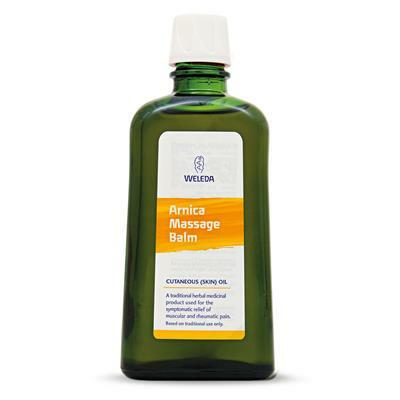 Arnica soon passes from the outside world of the garden to a cleaner world of tincture production and manufacturing , outdoor clothing is exchanged for whites and GMP (Good Manufacturing Practice) rules. Our gardeners keenly check each plant, before shredding ensues and the moisture content is measured. 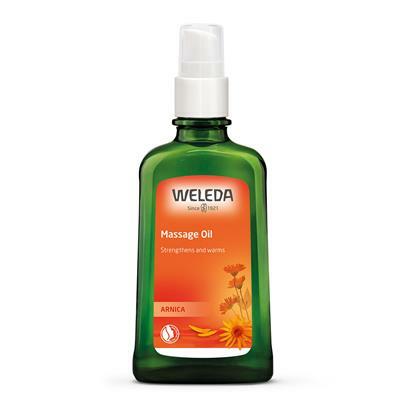 Organic grain alcohol and purified water quantities are calculated and then gradually mixed with the shredded arnica. The gardeners then ensure that the fresh macerate is allowed to infuse for two weeks with occasional stirring. The vessel is emptied, contents pressed and 50% arnica tincture is created and is now ready to use. The large guisti is primed, ready to receive kali soap, birch leaf extract, lavender and rosemary essential oils and fresh arnica tincture, all vital ingredients in our prize-winning Arnica Muscle Soak. 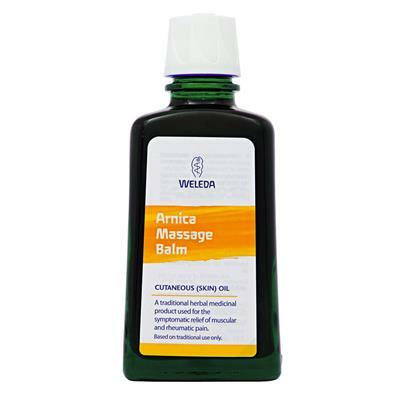 The same active ingredients with their synergistic effect, are combined together to create medicinal Arnica Massage Balm and warming Arnica Massage oil, firm favourites of rugby teams, mountaineers, ballet dancers and enthusiastic gardeners. 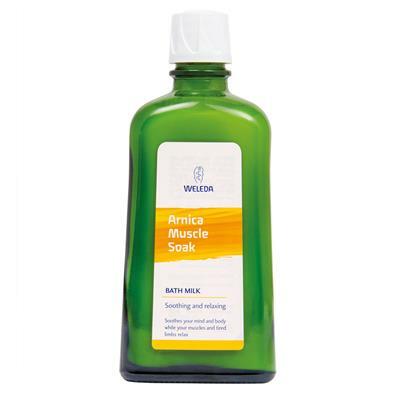 Arnica is a welcome sight post marathon running or any physical activity that renders the muscle a little weary. 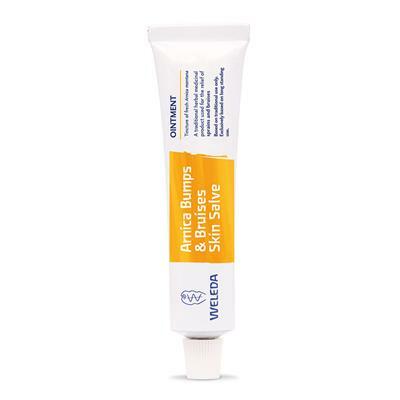 Ideally, full the full arnica effect, opt for an oral preparation together with external application so arnica can work from the inside out and the outside in.